CK is in Toronto this week for a team meeting. It feels like she barely returned from Hong Kong. As the weather warmed in our new neighborhood CK finally found a Good Walk. Suitable for both dogs and humans wanting a good bit of exercise. 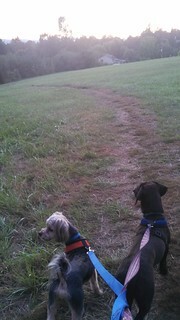 We've been trying to walk together with the dogs as many evenings as possible. Trying to wedge some time in the Busyness to get some time together, a bonus because it is doing something for our good health together. When she's away I try to keep up the walks for the dogs and I. Tonight we even spied a dead bird along the way. I had to laugh at this find making me think of CK, but we're definitely the type to be curious about such a thing. Were she here tonight we could have taken turns holding the dogs at bay while the other got a closer look. Having a supportive partner makes all the difference in life. I wanted to share this walk for my Love, who I am hoping is well asleep. A poem for a late evening in mid-August is the result of that desire to share. We walk to the park.